Major translational research initiatives at Vanderbilt University are moving discoveries from the bench to the bedside, and our scientists are working to transform both health care and health care delivery. In federal fiscal year 2014, the Vanderbilt University School of Medicine (VUSM) ranked 10th among U.S. medical schools for National Institutes of Health (NIH) funding, and VUSM funding from all sources has more than doubled since 2001. 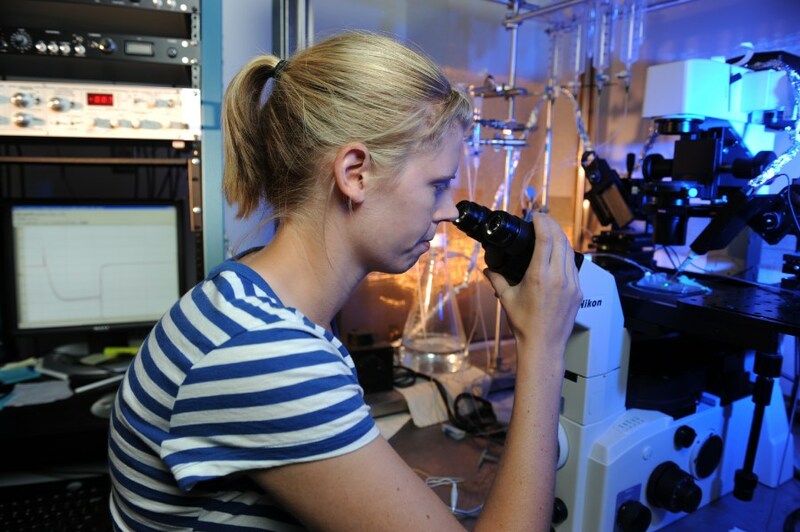 In academic year 2013, faculty across all disciplines received more than $521 million in external funding for research. The Vanderbilt Department of Anesthesiology is a key contributor to the institution’s standing, as it is consistently ranked one of the top extramurally funded anesthesia research programs in the nation. In 2014, the department’s investigators brought in more than $7.4 million in total extramural research funding. This includes more than $4.2 million in awarded NIH grants in federal fiscal year 2014, which placed Vanderbilt Anesthesiology 8th among U.S. academic anesthesiology departments in NIH funding. Edward Sherwood, MD, PhD, joined Vanderbilt’s Department of Anesthesiology faculty in July 2012 as vice-chair for Research, and he oversees all of the department’s investigational endeavors. A distinguished translational physician-scientist, Dr. Sherwood previously served as vice-chair for Research and Professor/James F. Arens Endowed Chair of the Department of Anesthesiology, as well as Director of the MD-PhD Combined Degree Program at the University of Texas Medical Branch in Galveston, Texas. A strong Basic Science Research Division, under the leadership of Eric Delpire, PhD, focusing on ion channel physiology, neurobiology and pain mechanisms. Excellent clinical and translational research programs in the areas of ICU delirium, sepsis, pharmacogenomics, oxidative injury, and preconditioning. The Perioperative Clinical Research Institute (PCRI), which provides all support services needed for successful clinical research. Numerous investigator-initiated and industry-sponsored clinical studies are conducted with the support of PCRI. Best-in-class anesthesia and perioperative information systems, with complete control of application development and a dedicated team of analysts devoted to making electronic data widely available to investigators and quality improvement teams. These systems are managed by Perioperative Informatics, an institutional entity directed by Brian Rothman, MD. The Vanderbilt Anesthesiology & Perioperative Informatics Research (VAPIR) Division, which actively leverages historical and current clinical data, with the goal of generating research and new control algorithms to positively impact patient safety. The VAPIR Division is under the leadership of Jesse Ehrenfeld, MD, and Jonathon Wanderer, MD, MPhil. Strong support from statisticians within our faculty, with expertise in experimental design and complex analyses of large datasets. The Center for Research and Innovation in Systems Safety (CRISS), which serves as an institution-wide resource for basic and applied research in healthcare informatics, patient safety, and clinical quality. This group also designs and evaluates informatics user interfaces, care processes, and medical technology. Click here for the CRISS website. BH Robbins Scholars physician-scientist development program that supports the academic development of early stage physician-scientists. This program provides a mentored research experience that begins during residency, fellowship, or appointment to the faculty, includes significant non-clinical time devoted to research and a two-year T32 research fellowship during initial faculty appointment . Scholars may request to participate in clinical or basic science fellowship training or pursue additional formal education (e.g., Master of Science in Clinical Investigation, Master of Public Health, Masters in Bioinformatics, and Master of Science in Statistics) offered at Vanderbilt during the latter part of the program. NIH T32-supported Training in Perioperative Sciences (TIPS). This program provides young physician-scientists with a two-year research fellowship focused on basic, translational, and clinical aspects of perioperative medicine. Two fellows are recruited annually, and the program is open to applicants that have completed residency training and that have an interest in perioperative science. In addition to providing a solid research infrastructure, the Department of Anesthesiology places a strong emphasis on faculty and fellow career development in academic anesthesiology. Active mentoring programs pair young and mid-level investigators with experienced scientists in both basic and clinical research. Our research productivity, as determined by publication in peer-reviewed journals, has more than doubled since 2010. In academic year 2014, faculty members published 149 papers in the peer-reviewed literature. Many of the papers were published in high impact, multi-disciplinary journals such as New England Journal of Medicine, Lancet, Physiological Reviews, and American Journal of Respiratory and Critical Care Medicine. Our faculty members regularly publish in Pain, Anesthesiology, and Anesthesia & Analgesia. Several faculty members are members of the FAER (Foundation for Anesthesia Education and Research) Academy of Research Mentors in Anesthesiology.